In a desperate attempt to improve his popularity amongst the Vainglory player community, Ardan enlisted Personal Image Consultants of Halcyon and The Greater Gythian Area Inc. What transpired was a four-month journey of self-exploration and exploitation that resulted in a pilot episode for a weekly drama series staring Ardan as a hard-nosed wildcard that will protect the innocent no matter how many bystanders get hurt. Other members of the Fold were cast as supporting characters to improve star power, but no one showed up to film, not even his own children. No one, except the one that wanted to get back out there and touch the people again. Thus was conceived the first, and only, episode of “Crossing Vanguard”. The Chief sits behind his desk with a stern look on his face. Ardan sits in one chair, with his feet up on another, with an even sterner look because he’s not about to be told who’s the boss around here. Chief– Churn-it Sergeant you gotta do something about this! Ardan– I am. (extremely heavy sigh) I am. Chief– You can’t keep telling me that. I need results! Ardan– You want results? I got your results right here! Ardan holds up a file. Chief– Isn’t that the office Birthday card for Stacy? Ardan– I got every churning signature. Ardan (in a low, menacing tone)- Travis called in sick with a real bad stomach flu, so I had to go to his house. He was so sick he couldn’t come to the door, so I had to boost myself up through his kitchen window he left open. I knocked his toaster off the counter and it broke, but I’m a reasonable guy and I’m gonna reimburse him. He was so frail and dehydrated he couldn’t hold the pen, so I gave him my last health pot I was saving for a rainy day, you know, in case I get ganked after saving my laner. He had barely enough strength to sign while I cradled his sweaty head before passing out again, but not before puking right into my coolant vent and causing my suit to overheat and burn my thigh a little. Ardan pulls back the weird skirt thing that he wears, revealing a quarter sized blister on his upper thigh and some singed leg hair. Ardan– How’s this for results!?! Ardan is standing with his arms crossed over his chest. He’s wearing the standard orange vest with yellow reflective tape. A fold out camp chair is open near the light pole with a copy of “Forbidden Love: Dragon My Heart Through Fire” dog-eared to page 45. Skaarf is on the cover of the paperback, gently caressing an ambiguous woman’s face with his stubby hand. The light turns red and the kids on the other side of the street start to cross. A Little Guy in the back lags behind, he brought home too many books from school and his backpack is super heavy, classic mistake. Ardan– Keep up the pace! The Little Guy tries to double time, but he’s still behind the others. The lights for the other direction turn yellow. Ardan walks out a few steps into the street. Ardan– You have to move, boy! Little Guy– I’m trying, mister. Ardan– Trying isn’t going to console your momma when your brains are all over the pavement! The Little Guy tries harder. Seconds tick down before the light will be green. Ardan grumbles a curse and triggers his Vanguard. He rushes toward the boy, punching him in the arm and granting him enhanced speed. Of course this also slows the other children, who are not clear of the street yet. The Little Guy’s eyes go wide with terror as he races out of control to the other side of the street and keeps going into a row of bushes. The light turns green and the cars speed through the intersection, clipping one of the other kids and sending him pinwheeling through the air. Ardan dodges around a few cars, snatches the hit and run victim out of mid-air and deposits him on the sidewalk. Ardan– Now get on home you little scamps. Little Guy (from inside the bush)- I think you broke my shoulder. The boy that was hit by the car wavers where he stands. Boy– Thanks Ardan, this concussion will keep my dad from making me play sports. Ardan (tussles the Boy’s hair)- No problem, get out of here. A low rumble starts in the distances but quickly get’s closer. Ardan (close up on his curled lips)- Not again. The rumble keeps growing until the first glimpse of a gnarly motorcycle gang crests the hill and rolls towards Ardan’s turf. Their choppers are full throttle and throwing up smoke as they weave in and out of traffic. As we get closer we see it’s the feared “Bleat Fleet” with their malevolent leader Corpus. Ardan (shouting over the engines)- You didn’t use a turn signal when you changed lanes! The goats barrel into the intersection, laughing their awful goat laughs in the face of common road protocol. Ardan leaps from his post and lands in the middle of the road, throwing up a Gauntlet and leaving yet another fist-sized hole in the street. Several of the goats slam into the barrier and tumble from their bikes. Corpus (voiced by Bobcat Goldthwait)- Ooo, the baby has a play pen! Right before he collides with the Gauntlet, Corpus unleashes a Bleating Shriek that pierces right through to Ardan’s already scarred soul, knocking him back and sending him into a dream-like trance. The gang gets themselves back together and drives past the sleeping giant and down the street. Cars proceed as usual, careful to avoid the prone Ardan thanks to his reflective vest. After several long moments, the distinct ring of his cellphone wakes Ardan. He groggily stands and stumbles over to answer it. It’s the Chief. Chief– Ardan! I just got word you were bested again by Corpus and his gang. 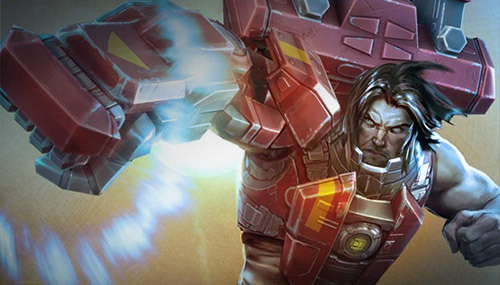 Ardan– I’ve got in under control. Chief– I heard he put you to sleep and spit on your forehead. Ardan (wiping spit)- Don’t believe everything you hear, Chief. I got this. Chief– Well, then I guess you already know where his hideout is. Chief– Because I just got a hot tip. Ardan– I got a hotter one. Chief– So, we both know where to find him. Tense silence. They never got along since the Christmas party when the Chief gave Ardan a couple’s massage coupon during the white elephant exchange. Chief– Are you sure you don’t need any help? Ardan– If you’re just dying to say it, why don’t we both say his hideout at the same time. Chief– You’re such a rebel. Ardan (talking over him)- Aegis factory. Duh. Idiot. Chief– Go get him, Ardan. Corpus and his gang are playing jacks on the ground. It’s a really raucous affair, with much name-calling and playful hitting. The sun cascading through the open door is suddenly blocked by a large form. They squint towards the door, and are shocked at what they see. It’s Ardan, in case you didn’t already guess. Corpus– You’re a little out of your jurisdiction, aren’t you? Ardan– Justice knows no bounds. Corpus– I’m pretty sure there are clear guidelines for enforcement of any law. And you only have minor responsibility on one side of a four-way intersection. Ardan realizes he’s made a rookie mistake. Get’s an idea. Ardan– You’re third eye is stupid. The Bleat Fleet hop on their hogs and ride them into a circle around the two combatants. Ardan and Corpus glower at each other across the makeshift arena, making faces and pretending to crack their knuckles, because Ardan has soft joints and Corpus doesn’t have knuckles. Corpus– Those kids are going to be in trouble without their widdle helper. Ardan– Oh yeah? Well, goats riding motorcycles doesn’t make anatomical sense. Corpus launches himself at Ardan with a flying headbutt. Ardan lacks movement speed so he takes the hit full on in the chest and falls backward, sliding on the dusty ground. The Bleat Fleet cackle with glee. Ardan rubs his chest and climbs to his feet. Ardan– Get off my lawn. Ardan– Sorry, I have to say that every so often regardless of the situation. Ardan rushes forward with a big punch that scales off his HP and barely misses as Corpus scampers away. Corpus– Taste the four horns of the symmetry! Corpus jukes to the left, spins to the right and drives up the center, goring Ardan with a Horror Spiral that plunges deep into his gut. Ardan crumbles to the ground amongst the jeers of the gang. A close up on his face reveals pain, doubt, and finally gumption. He looks up and around, searching for an answer. His eyes finally lock a barrel marked “Highly Defensive” atop a pile of similarly marked barrels that are stacked in a convenient and precarious pyramid. Corpus– Anything you want me to tell that children? Ardan– Yeah, see you Monday. Corpus closes the distance for a final strike. Before he reaches his target, Ardan busts it over to a plank leaning against the wall. He punches the crap out of the wood, sending it up toward the ceiling. It crashes into a light fixture, that swings into another, and another, domino-ing down the line until the last light hits a wheel of cable. The cable rolls off it’s ledge and lands on a box and keeps rolling until it bumps a crate of completed Aegis Shields. The crate tips over and falls into a statue of Adagio, that has no business being there, which topples into the barrel Ardan spotted. That barrel falls, leading to a chain reaction of all subsequent barrels. They roll down like a wave, flattening members of the biker gang and perfectly weaving around the attacking Corpus until they finally impact with Ardan. The burst of the barrel gives him a HP barrier that defies sensible balancing for a fair game. Corpus’ attack lands and immediately glances off a near impenetrable shield of crystal blocking perfection. The block sends him flying back into a pile of his lackeys. Corpus (lifting his head with great effort)- You haven’t heard the last of the Bleat Fleet! Ardan– Do you smell gas? Ardan flicks a pebble at Corpus. That is enough to ignite the gas tanks of the motorcycles, which explode in a ring of fire around the lone hero and engulfs all of the gang in the flames’ redemption. Ardan (lighting a cigarette he pulled from no where in particular)- Pedestrians always have the right-of-way. That’s great. Love your stories. And the commercials…haha!